Do you remember all these pictures you´ve had when you bought your first yacht and envisioned yourself in her? Where have you been in your dreams – at the helm, wrapped in thick oilskin fighting in a storm and Beaufort 9? Or was it sipping on a Mojito on the fore deck whilst contemplating a spectacular sunset with dolphins jumping through a rainbow? If I ask myself of that picture: It was downstairs at the port side sitting at the chart table to work out the best course and writing down my watch´s highlights into the logbook. This chart table holds me captive, fascinates me. Maybe that’s due to my fascination with charts, weather forecasts and plotting courses, maybe it is because because I love being at the radio (here is an article on the Short Range Certification (SRC)) or maybe it´s because my project manager-genes put me onto the very spot where a cruise is planned and determined. 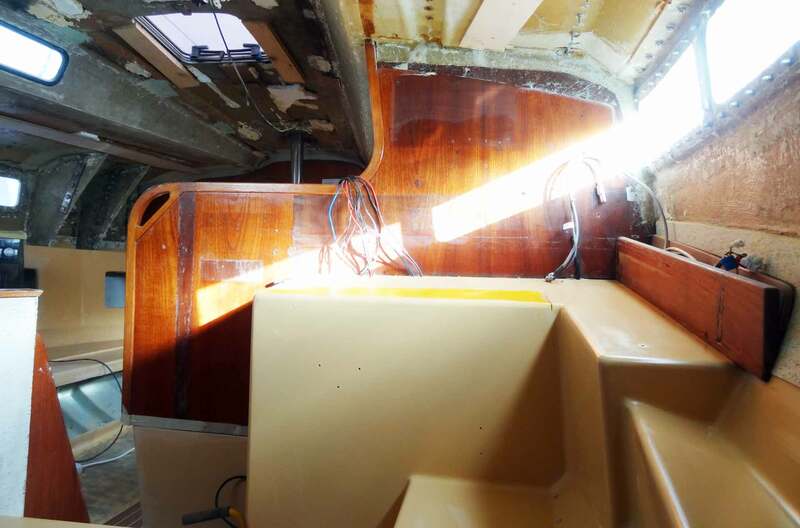 So refurbishing the navigator´s place of my yacht OLIVIA is a major highlight for me – and here are my plans. Or, well, let´s call it “thoughts”. When I was looking for a yacht it was clear to me that the Navigator´s place is one of the most important onboard. And one of those spots ordinary a used yacht purchaser won´t attach too much importance to, as I´ve read initially. When searching for the right yacht most people look for stowage, spacious cabins, powerful engines and a solid structure. Which is important, no doubt about that, but few people would invest too much thinking into: “How am I going to plan the cruises, do the writing and chart work?” They barely take a seat and simulate plotting a course or talking via radio. When I had a close look onto the Leisure 27 I was one of those. It was only when I first visited SY OLIVIA and discovered her roomy navigator´s place I came to realize of how important this tiny spot really was. A King´s Cruiser 33 is, well, 33 feet long over all, which means, I do have 10,40 meters in length. The area for the navigator´s place measures some 100 cm in depth and 1.20 meters width. Sitting on the quarter berth the navigator of my ship had had a big chart table with a folding top to stow the charts or a logbook. In front at the bulkhead separating the entryway-area from the saloon a Navtex FMD 20 was mounted – funnily enough the radio had been mounted over the navigator´s head right next to the companionway (probably because it was in good reach from the cockpit, but in no way good for radioing whilst sitting at the table). At his right, two electric control panels had been mounted in addition to the original panel which is situated right under the entry to the cockpit over the ladder. All in all a spacious room: But over time worn down and in many aspects not ergonomically logical. To me it was clear that I´d have to refurbish everything. Chart Table: What is essential? 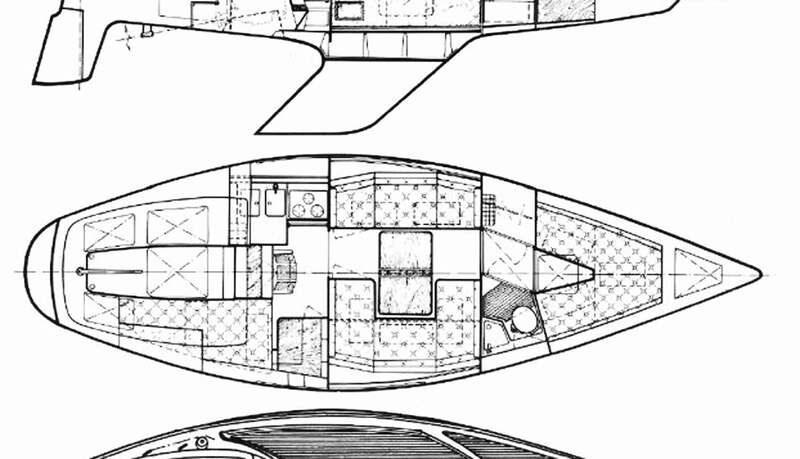 I have seen yacht-sketches where the navigator is placed facing backwards, which I find is an odd thing. When buying a yacht, you should go for a ship placing the person who is responsible for courses, logbook and radio-stuff into a forward facing position. Smaller sized craft of less than 31 feet simply don´t have the room for a separate chart table and offer combined solutions where a slipping or folding table can be utilized for chart work. That´s a work-around in my eyes. I personally would always go for a proper navigator´s place. This area should be situated at the middle of the hull where there are the least motions. A chart table (with folding top for normal sized charts) should be obligatory, as well as enough stowage for pencils, a calculator, dividers and stuff. This is where the previous owners of my yacht have added venturesome built little boxes here and there to keep that stuff which was an ugly mingle-mangle in the end. The center of the navigator´s place in every yacht is a nicely joined, solid wooden chart table. I do have some hope to being able to preserve the original one previously mounted in my yacht, but the basis to mount the table onto is certainly not usable anymore: Too much holes have been drilled here over time so I got rid of it. Maybe I can combine a newly built basis with the old, nicely rounded table which has a big box for stowing the charts. What I will certainly have to add is a clever solution to keep pencils, dividers and stuff. I think a box at the far right end of the table will do. Of course a reading light with a flexible arm is mounted to be able to work when other crew members take their well deserved sleeping hours. When working at home in my kitchen I do have a knife-holder which is made from wood. The knifepoints are placed in a narrowly stiff-bristled holder which both protects the hands from being cut and hold the knifes tightly. I am thinking of using a similar technique to keep the pencils in place. But I do not know yet how to build such a thing. Maybe an upward flipped broom can do? One thing I am going to change for sure: Up to now the chart table was foldable. Keeping it in an upright position meant to have a lot of room to reach into the quarter berth which was used for keeping the sails. At the other hand the folding mechanism due to the heavy weight of the solid table has been worn down excessively and so was the hole in the ceiling cover where the folded table had been locked in place widened over time to an ugly gaping hole. I am slim. I don´t need the table to be folded away. 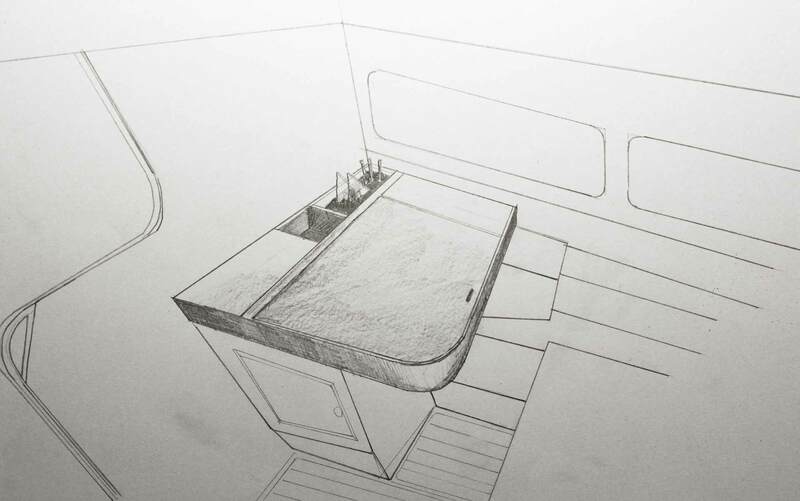 When planning a new one I can maybe cut down the length of the table of some centimeters to make the entry to the quarter berth a bit wider. Modern stuff or classic old school cruising? Toughbook vs. Logbook. Which brings me to the old-new question of I am really going to actually write a logbook. I mean, by hand. By German law skippers of recreational craft are required to keep a logbook, in many other countries it´s an obligatory duty for skippers too. To keep it means to physically write it by hand because written stuff cannot be manipulated in case of bad things happening as easily as data-based logs. On the other hand, I´ve read so much articles on if and how and when a skipper should keep his logbook and when it is better to not having one that I think a digital solution instead of the old fashioned blue wrapped leather logbook with a silver anchor on the front is the better alternative. A Toughbook is such a great alternative. I just don´t know because … well, because OLIVIA is a classic cruiser. She´s 40 years of age and when I do take a look onto her Elna RT 2048 radio – a true classic when it comes to high quality radio equipment (of the Nineties) – I just can´t see myself plotting charts online and having Excle charts to keep track of the water consumption. She is an old ship. Why should I add modernity to her where generations of skippers have perfectly managed to bring her in safely solely with paper charts and pencils? Adding a Toughbook here would mean I would have to go for replacing the old equipment too: The old (but perfectly working) Elna radio with it´s old fashioned telephone-mic as well as the thermal-printing Navtex. And preserving the King´s Cruisers character and only add modernity where needed and reasonable is the overall motto of my refit-program. 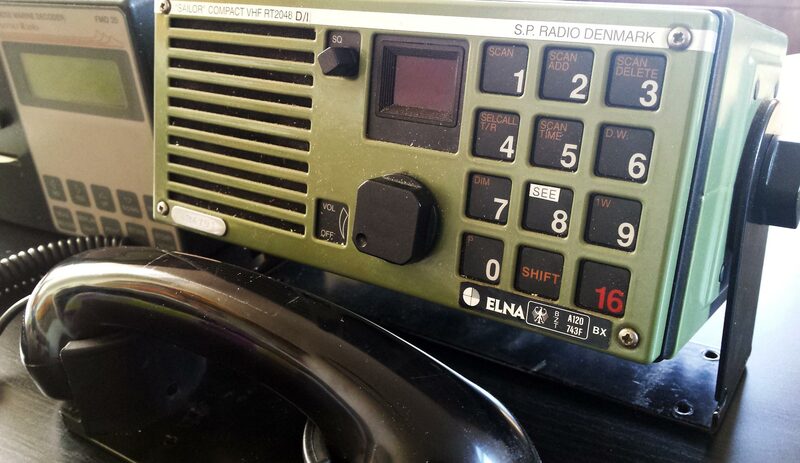 SY OLIVIA´s current radio equipment: The ELNA RT2014 VHF-transceiver. Two hearts are beating in my chest. I love the Elna. But, let´s say, a brand new Raymarine Ray70 is a hell of a VHF-radio! Besides it has Digital Selective Calling, a service my old Elna doesn´t offer. No matter which decision I take in the end, one thing is clear: I want the radio mounted in front of me to reach it when sitting at the table. I´m not quite sure if I´d place it at the bottom of the table, in sight of my eyes or a bit above to being able to read and reach it when standing next to the table. Latter is my favorite right now because that solution would create space right in front of my eyes to have an area where I could hang a cruise-plan with waypoints, a small chart or other important information I do not want to keep stowed in the chart table. Another aspect I am thinking about is where and how best to keep all the printed stuff I´d need when underway. When taking over SY OLIVIA from her previous owner I checked her chart table and was astonished how full the stowage under the top was – charts, okay, but I did also found a book on the Danish south coast, a marina guide, a tidal charts book o f the rivers Elbe and Weser, a guide book on international radio procedures and flag-signals and some more stuff. A college block for taking notes, a smaller notebook probably for taking notes to have them in one´s pocket when steering the boat – to cut is short: There´s a lot of stuff besides charts to be stowed somewhere near the navigator´s place. So I decided that I´d add a kind of book shelf on the right edge of the new table able of keeping a handful of books and guides. Maybe I can use the ready made shelves offered by boat stores which are originally intended for the pantry: I think taking a closer look at the products here could bring about a solution. These products are made of teak so that they would blend in perfectly I hope. Another point is where to keep the documents: ID cards, legal certifications, SRC and other official documents I might need when entering a foreign port or when being checked by customs or police officers. Which brings us to the good old money, the cash box. Of course, we won´t carry thousands of Euros with us so I think there´s no need to add a safe (which should be laminated to the hull and situated far away under the decking in case of a robbery or break-in), but I need a small cash box for paying demurrage or fresh bakery in the mornings when tied to the piers. I put the cash-box next to the pencils, adding another small box for keys and all the spare keys (made floating with kork buoys). I am sailing with my family, which means, wife and children. 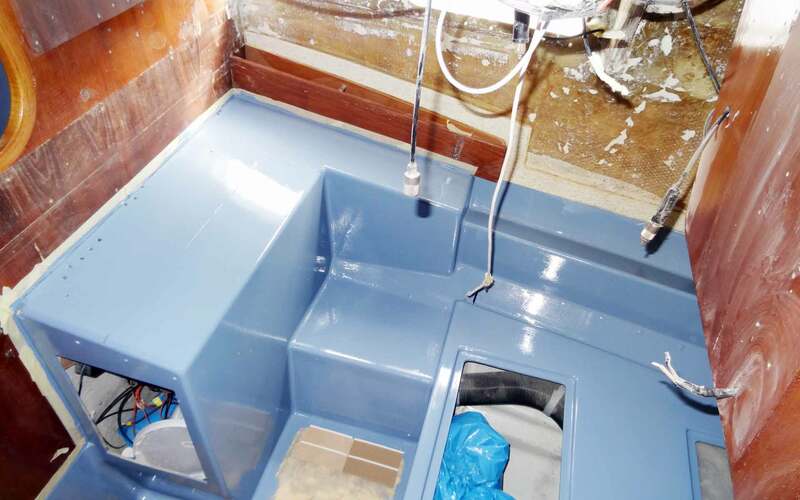 Even if not, having the essential safety equpment at when when and where needed is an important task for me when planning the refit of my yacht. It should be easily accessable from both the interior (saloon and pantry at most) and the exterior (cockpit) where most of the injuries might happen. On the other hand the stuff should be stowed safely – sailing with children means they want to push every button they see. Activating an EPIRB can be very troublesome … But what is essential safety equipment? I think, there are three sides to this aspect: Injury, fire and distress. For all the smaller and bigger injuries I think it is good to have a first aid-kit at hand. There are specially made first aid-kits for yachting available, measuring some 40 x 30 x 15 centimeters which I consider perfect. They do contain everything from bandages, band-aids to breathing aids and a certain amount of medicines. The status quo: All Gelcoat surfaces have been sanded and are primed. Awaiting their shiny new white. Concerning fire, I´ve decided to put extinguishers in every cabin of my ship: One in the fore cabin, one in the saloon and one in the aft-section. Additionally I´ve learned that special blankets are a very effective way to put out fires occuring in the pantry. So next to one extinguisher the “safety-cabinet” will contain such a blanket – easily reachable from the pantry vis-a-vis. Last aspect is distress. Minimum equipment for every seagoing yacht should be – from my point of view – an EPIRB buoy and red flares or distress rockets. 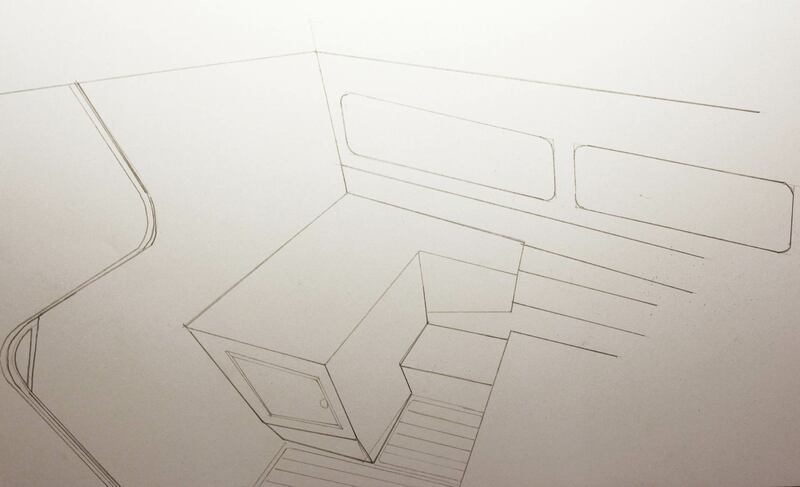 In my sketch I add a safety-cabinet to the rearward facing bulkhead right next to the entryway to the cockpit. This position means one could reach for the stuff both from outside as well as from the inside. To prevent my children from accidentally opening the cupboard or worse letting go off a rocket or the EPIRB is a matter of teaching and training them as well as of the closing- and fixing-mechanisms of cupboard and equipment itself. A nice sidekick: By adding this cupboard the ugly big hole stuperous filled will be covered by the new nice wooden safety-cabinet. This is the perfect Solution for my King´s Cruiser. Isn´t it? 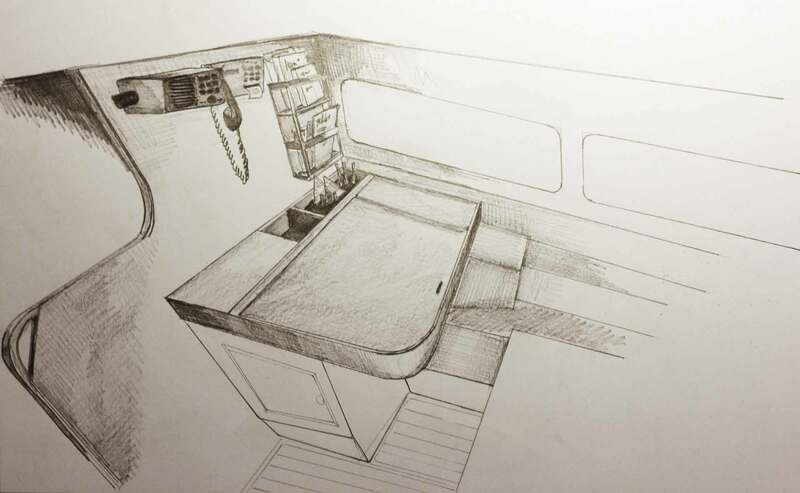 So after having sketching around with my pencil I came to the conclusion that I won´t have to change too drastically what was the initial plan of Pelle Petterson when he was drawing the lines of the King´s Cruiser 33 for Fiskars in the early Seventies. I am still thinking of replacing the classic electric stuff by modern radio-equipment, a Toughbook and maybe a second plotter which would be connected to the main plotter in the cockpit, but despite these thoughts the overall plan looks nice and coherent for me. Sitting at my new table I should be able to do the chart work, plan the cruise and keep the log. Well, of course, it´s a long way to go to this point and next steps are quite clear: Preparing a whole new electrical layout is the groundwork starting this weekend by ripping out the old wiring. After having painted the whole interior in shiny new yacht white (here´s an article on step one and step two of this process) is next. 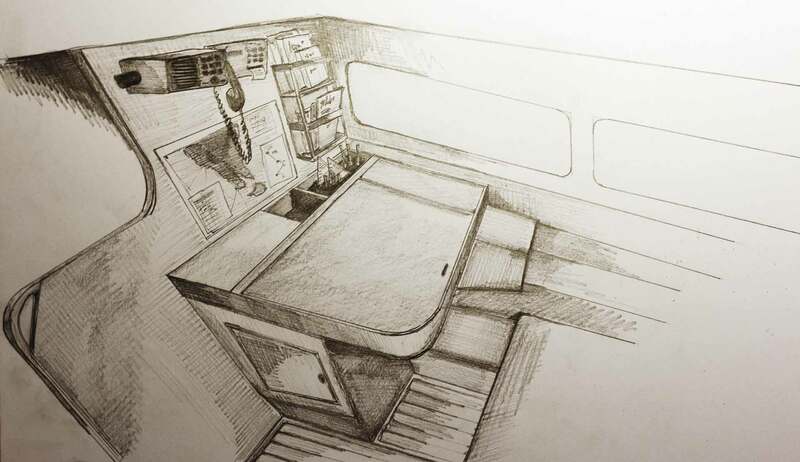 Even if I resume working in the fore cabin (here are my plans with the forecastle of my yacht) and that´s plenty of work to come, I will keep my ideas for the navigator´s place in mind and maybe they will change a bit over time. We will see. What´s important for you when it comes to navigation and keeping a log? I am looking forward to your comments.